Development professionals work to make positive change happen through their programs and initiatives. However, it is very hard for them to measure their projects’ impact and evaluate how efficient they are. The best development projects are identified by their impact and their efficiency, and the best way to measure these is through a good project monitoring and evaluation system. In the past, information about a project’s impact would be collected through a laborious exercise involving surveyors and reams of paper. Using pen and paper surveys for project monitoring and evaluation led to inaccuracy and came at a high premium in terms of money, time, and effort. Thankfully, with developments in technology, this process has become digital. This has led to increased efficiency and lowered the costs of having a good project monitoring and evaluation framework. Now, development programs and projects are expected to have a robust M&E system in place. The UN’s Sustainable Development Goals, for example, have a rigorous multi-level project monitoring and evaluation system. The organization, further, pointed out that the international community could not afford a lag in measuring progress in development. 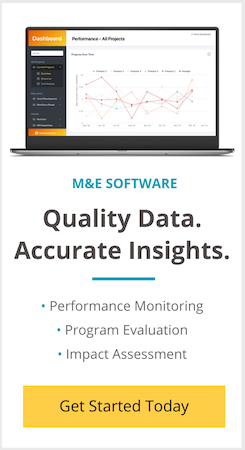 M&E is, at its simplest, a process to measure the performance and results of a project. Ignoring the need for a robust project monitoring and evaluation system is detrimental to your program and its prospects for funding. A good M&E system promotes effective policy changes and the accountability of stakeholders. Designing a good project monitoring and evaluation plan, while essential and vital, can be complicated. Thankfully, there are several resources to help you with that. We have gone through a lot of guides and these are the best project monitoring and evaluation guides that we could find, written by some of the most reputed organizations in the development space. Whether you’re curious about the basics (like what monitoring and evaluation is), attempting to determine the importance of project monitoring and evaluation in general, or working to identify relevant indicators, these guides are a fantastic starting point. While primarily designed for UNDP staff, the handbook acts as a reference guide that integrates planning, monitoring, and evaluation for effective program design. With modules on conceptualizing and creating a project monitoring and evaluation plan, monitoring for results, and measuring impact, it provides prescriptive content on what needs to be done, by whom, and by when. Report formats and templates complete what is an excellent companion across the full cycle of the development program. – Lacks references to recent trends like mobile data collection. This handbook is a handy companion guide to project monitoring and evaluation, starting from answering basic questions before going on to discuss some basic approaches and evaluation methods. Best looked at as a quick overview of the project monitoring and evaluation field, it is written in a question and answer style that makes it more accessible. By comparing different methods and approaches, it is a convenient starting point in understanding the subject. If your project concerns energy, sustainable development, or the environment, this step-by-step guide is the resource for you. The methodical and accessible approach it adopts is useful for both experts and amateurs, and it provides forms and templates that help you structure a comprehensive project monitoring and evaluation framework. This is an ideal checklist for the expert and a how-to guide for people new to project monitoring and evaluation. As a bonus, it uses examples and illustrations for increased clarity. As a reference guide for International Federation of the Red Cross and Red Crescent (IFRC) personnel, it is ideal for those responsible for project monitoring but also useful for volunteers, donors, and partners involved in a development program. The guide is divided into 3 sections — the first focuses on the conceptual framework for M&E; the second focuses on six key steps for M&E; and further, the appendix provides additional tools, resources, and projects for M&E. With a comprehensive breakdown of the important approaches as well as a checklist approach to the setting up of a monitoring and evaluation framework, this guide works for almost everyone. – Comprehensive and methodical in its approach, it gives you the information you need at the point that you need it. – Annexed resources and updated content make for exceptional supporting reading. This guide comes with a simple editable M&E framework template, and is a simple handbook to setting up an monitoring and evaluation framework conveniently. It uses a simple example to build on the various steps and milestones for setting up an M&E system, and contains simple tables that compare different approaches, giving pertinent information in an easily understandable fashion. Further, it links to resources on understanding other aspects of a program, including how to communicate project monitoring and evaluation results. These guides give you all the information you need to figure out how to design a good project monitoring and evaluation framework. These guides cover understanding the right approach and method for your project, identifying the right kind of data to monitor, and deriving the right conclusions. We hope that these resources will be useful to you and lead to better project monitoring and evaluation of your program. This is fantastic, thank you so much for such Information. It valuable to my work. A very good reference compendium for students and experts in the M&E field. Thank you so much for useful information! Great we need more similar material to understand M&E in real scene. Comprehensive and useful guides! Thanks for sharing these valuable resources! Thank you so much. Useful documents. At IFAD we’ve used these and other guidelines to develop this training toolbox. It is viewable on handheld devices and you can pick/skip lessons on demand. In my view it’s the number 1 (and well consolidated) guideline! Thanks Good resource for M&E professional. Excellent knowledge base. In addition to these great resources, I would put in a plug for the M&E Guide created for the State Department’s Bureau of Democracy, Human Rights and Labor (http://www.state.gov/documents/organization/138430.pdf). This is a good compilation. Too many references will lead folks into the weeds. I like to get such kinds of materials. Very useful guide.its helpful to my current project. Let me know if you need some URL’s. The EU/EC? They also have something cool to offer …. It is a very good reference material. Thank you! Very helpful and informative! Hi, anything on Impact Investment Monitoring and Evaluation? interesting and informative readings. please provide more along this line/topic. Am using the UNDP manual in my PPM class. I found out that the manual is helpful! Compliments for this insightful information. Another good reference guide for M&E comes from the World Bank – Ten Steps to a RBME System. Pros: Provides a steps by step model to build a system, that not necessarily means the use of computer system. Cons: While it’s focused more on public sector management, the process can be applied in the NGO sector.